Hello everybody and happy holidays! Merry Christmas! And Happy Birthday to ME! Yes, so for this one occasion, here’s a special treat for you. It’s a winter season, where there’s lots of snows and ice. In video games… I like ice. It’s my favorite element. There’s just something cool about those cold blocks of ice usually formed into one big, sharp needle getting thrown to the enemy. Or occasionally, encasing them in a big block of ice, immobilizing them so you can either leave them or do whatever to them while they’re being helpless. It also helps that those who wield the ice tends to be the coolest character. No, I’m not being punny here. Kind of. Those who wield the ice elements usually has this one trait shared with the element itself: Coldness. They tend to have calm and cool composure, enabling them to plan where and how they would apply the form of ice and cold to their foes. For the most part, they tend to be very smart as well. Of course, not every ice users are like that, even those in this list, but you get the idea. And because ice is my favorite element, and it’s nearing a special day to me, that is, the day I get closer to my lifespan limit and time where the cold hand of death claims me… I mean, my birthday… I want to make this one special. That is, rather than going for 10 characters like usual, I’m doubling the size and make it 20 characters. Yes, I have that much spare characters that I like best when using ice. Hello everybody and welcome back to another Countdown Post of mine, continuing with the Weapons on a Stick theme. Now, shall we say that if we switch the blade on that stick into a GIANT mass of weight… What do we get? Hammers, that’s what. In the beginning, hammers were invented to construct structures. Mostly by pounding nails to woods or nails or anything. At times, people also use it to construct weapons, that’s what blacksmiths do. It just happens that the bigger the hammer becomes, the more destructive it becomes, sometimes even becoming a reverse of its original purpose, a bludgeon weapon to either demolish structures, or just bash someone’s skull, either breaking them, or knocking them away for a very long distance. It’s also a popular weapon for clerics who abhor steel sharp weapons… and it’s also a popular weapon for anime girls who tends to get annoyed with their male friends. But we’re not gonna talk about anime. The hammers tend to be a powerful weapon, slow at swing, but packs a massive weight in each blows. And so, within this list, 10 Experts of Hammers in video game history shall be listed and we will see who stands in the top to put the mightiest hammer down there is. As usual, the two main rules apply: Only one character per franchise, and only from the games I played. And only from things originating from video games. 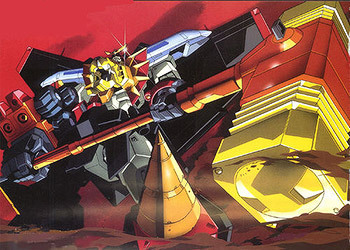 I swear to God, if anime-origin characters can be put in this list, I would’ve happily put in the GaoGaiGar in, due to the massive Goldion Hammer or Goldion Crusher, and it was showcased in Super Robot Wars! But alas, rules are rules. So let’s not wait any longer. It’s hammer ti– Wait, no, I don’t say that. I’ll reveal why later. Onward to the countdown then! Because Smite is awesome and is definitely one of the better MOBA’s to play. Give it a chance, guys. It all began when a certain event in console gaming shook me so much, as much as a geek like me could handle (We’ll get to that later), that I retreated to PC gaming. At first I was just an ex-Dota player, who played in my campus casually, and after that retreat, I discovered Steam… and Dota 2 was free! I was able to indulge myself in the game as a small retreat, but due to TV Tropes and a certain youtuber/content maker known as the Green Scorpion… Well, long story short, I got introduced with League of Legends. I was skeptical to join at first… until I discovered there was an Indonesian server provided by Garena. Long story short, I simply got ADDICTED. I spent hours and hours within the year in playing that game, exploring its nuances, getting better. In addition, I also occasionally slips into Dota 2 as well. The latter is a harder game, but nonetheless enjoyable. And as time passed, more big stuffs came in, in form of Smite and Heroes of the Storm. All in all, I fell in love the MOBA genre for real… something that was supposed to be a runaway place. However, as time passed and I also became more and more impressed with countdown makers… It hits me one thing… Most of them are only giving credits to League of Legends. I know everyone have their own preferences, and it’s okay… and it may be just me getting petty. But I thought that the other big MOBA games deserve their own recognition amongst the community. This, in addition of several unsavory stuffs amongst the genre… that is, being a fan war that attempts to badmouth the other product to make their own product look better… (for instance, ‘a Dota 2 fan calling the genre MOBA should be lambasted because it’s League that coined it, Dota 2 is ARTS damn it!’. No, shut up, enough with this elitism.) It doesn’t endear me one bit. It’s like saying you can only pick one. Pick just one to master with dedication, I can understand, but pick just one to love and badmouth the rest? The hell?? And that was why I made the MOBA Season series of videos. I might have very little audience so far and it still pained me, but does that deter me? No. I did it anyway, because I start to enjoy doing what I do and expressing love to what I like. The MOBA Season is basically a series of countdowns where I list up my favorite things in certain MOBAs, though I put it on hiatus for now to hopefully expand my area of interests in the eyes of many. Besides, I don’t call myself pro, I’m just your casual scrub who never played Ranked. So things are mostly on personal preferences. And after this, I might even expand the season for things other than countdowns. For instance, common cliches that are often featured throughout every MOBAs. It’s not going to make your play style better, but it might be some interesting tidbits. But for now, after this, I will first post the videos I have made so far for the Season, before I move on. If you’re interested in this… Good for you!